Ollie Frith is back this week and shares a great conversation with Chris Kilkenny. Chris’ Twitter bio is: ‘care leaver – speaker/campaigner – passionate about equality – ACES – I am a black box for the failed system’. Chris came himself from adverse childhood experiences and now uses his experiences to spread the word about ACES and how to take positive steps to alleviate its effects. Chris is involved in giving keynote speeches and training around ACES. He received no qualifications and as an adult started to question why this happened. 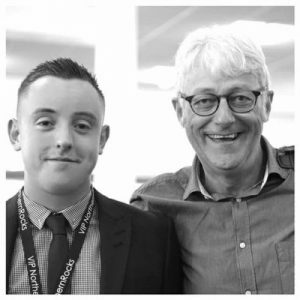 He knew he was capable of achieving qualifications so why did it happen and how could he now help other young people in the same position as him? He tries to look into his own ‘black box’ of education to find out what happened. He attributes his ability to speak about his situation for the benefit of others partly to his character growing up in care homes. He was always loud but he was also always a good listener. He picked up words easily and was able to use them to express himself. So when his own case was being discussed at panel meetings, he was able to pick up the terminology and use it himself. Chris says that when young people appear to be more capable or questioning adults intelligently, it can be very threatening for the adults. When Chris turned up at the Job Centre with nothing on his CV, he pointed out to the staff that they should treat him as a blank canvas – they said that wasn’t how it worked. He had talents and skills but didn’t have them on paper. Fortunately, Chris came across someone who spotted his skills and his potential – David Cameron who has appeared on the Pivotal Podcast himself. What can schools do to support more children like David Cameron supported Chris? Chris believes that if more teachers took just 5 minutes a day to ask a young person how they are feeling, to have a normal conversation on a human level, unconnected with school work, their lives could be transformed. This is what happened to Chris’s brother as you will hear in the episode. Chris is open about how he feels those in education should love their students. Love, care and support is what we should be offering to all young people, alongside exam results. Chris asks how we can expect young people who have never experienced a hug to be able to make meaningful human connections when they are adults. When everyone in their lives have given up on them, schools can still give them love, care and support, if they turn up. Listen to Chris’ explanation in the episode for more details on how these schemes make such a difference to young people’s lives – and revolutionise relationships between schools, local communities, young people and their families.